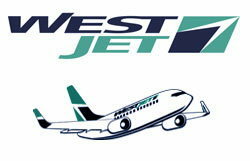 Air Canada – West Jet Competition Slashes Fares To Barbados! Great News For Barbados Tourism! Of course, pretty much anything can happen between now and November, but lets look at what increased competition has already achieved. Book a seat from Toronto to Barbados for travel on the first week of November, 2008 and with Air Canada the cost is currently CAD$898.05. Travel on the same dates with WestJet and the cost is CAD$673.13. Both fares include all taxes and surcharges as they have been applied today (5th July). Thanks Adrian. That is excellent news. Now… enough writing for today friends. TIME TO PARTY!!!!! You have to hand it to Barbados Prime Minister David Thompson – even other politicians who should know better are falling for the big lie that words mean that something is really happening with integrity legislation. Mr. Grant’s heart is in the right place. When he spoke he was trying to convince his own government to implement Integrity Legislation, but he made the mistake of believing some Barbados government politician at some cocktail party who said “We’ve done it”. David Thompson and his DLP government have NOT implemented ITAL – Integrity, Transparency and Accountability Legislation. During their election campaign last December they even lied to voters and said they would implement a Ministerial Code immediately upon forming a government. 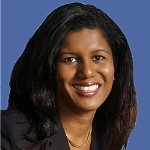 The DLP published a draft of the code, but they lied and did not implement it. As to transparency and conflicts of interest, one of David Thompson’s first official acts as a newly-elected Prime Minister was to borrow the corporate jet of a company that does business with the Barbados government – and to refuse to release any details of the costs and arrangements. Prime Minister Thompson talked about implementing ITAL, but he did not and he has not. Instead, he says he has set up a “committee” that has embarked on what will probably be a two year process to “research”, “consult” and “draft” whatever it is that they intend to present to the people of Barbados. Have any meetings been held by this “committee”? Have any public papers been published by the committee? Do they have a website, an address, a phone number or email address to receive submissions from the public? We can’t find the contact information – perhaps one of our readers can find this invisible ITAL committee. Meanwhile, the Barbados government has refused to implement a prohibition on conflicts of interest in the awarding of government contracts. Yup —- those DLP piggies need a couple of years to feed at the public trough before David Thompson will implement any integrity legislation. So it continues to be legal for elected and appointed government officials to award government contracts to their own companies, or companies owned by their spouse or children. Just the same as it was under the previous BLP government that set new records for greed and corruption. 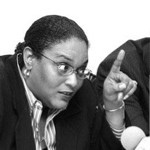 Lindsey Grant and the people of St. Kitts and Nevis should pay attention to the broken promises of the Barbados Government and the reality of integrity legislation in Barbados: it doesn’t exist. Mr. Grant should remember that words are not actions. 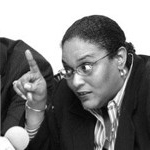 Barbados Election 2013: Mottley vs Dr. Byer-Suckoo? Mia versus Esther? No Contest! Our old friend Yardbroom has written an article on Barbados Underground asking why the DLP Government is giving Byer-Suckoo so much exposure in the media, at the United Nations and at government functions.